Married Name before 1951 As of before 1951,her married name was Gigray. Married Name 22 October 1951 As of 22 October 1951,her married name was Kubeck. Esther Barbara Frohreich was born on 21 September 1919 at Yankton, South Dakota. Esther Barbara Frohreich married (?) Gigray before 1951. Esther Barbara Frohreich married William Kubeck on 22 October 1951 at San Francisco, California. Esther Barbara Frohreich died on 14 December 2001 at Washington, Oregon, at age 82. 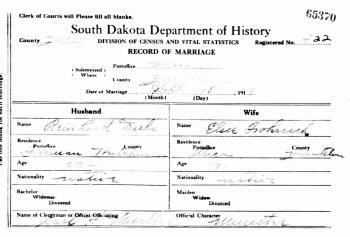 15 January 1920 Walshtown, Yankton, South Dakota Esther Barbara Frohreich was listed as a daughter in Hugo August Frohreich's household on the 1920 Census at Walshtown, Yankton, South Dakota. Adam Weiss was born in 1871 at Russia, USSR. He married Barbara Dubs before 1895. Adam Weiss married Susanna Haar, daughter of Heinrich Haar and Dorothea Mueller, on 1 March 1910 at Russia, USSR. Adam Weiss died on 24 August 1911 at North Dakota. Port of Departure: Southampton, England. Name Variation Christian A. Weiss was also known as Chris A.
Christian A. Weiss was born on 2 February 1904 at Russia, USSR, also reported as Germany. He was the son of Adam Weiss and Barbara Dubs. 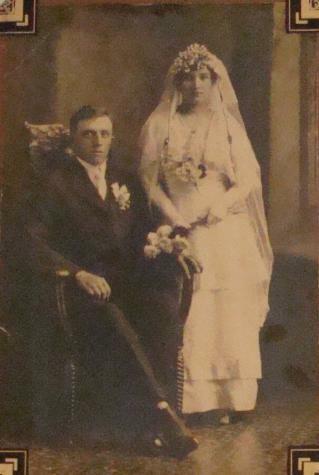 Christian A. Weiss married Jane Saylor, daughter of Charles Saylor and Myrtle Estella Gibson, circa 1924. Christian A. Weiss died on 18 December 1997 at Orange, California, at age 93. 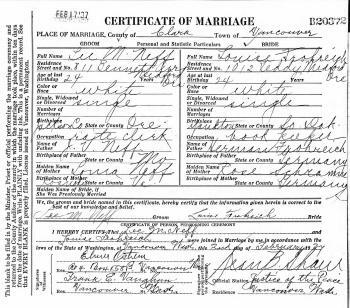 15 January 1920 Walshtown, Yankton, South Dakota Christian A. Weiss was listed as a brother-in-law in Hugo August Frohreich's household on the 1920 Census at Walshtown, Yankton, South Dakota. 1 January 1925 Waterloo, Black Hawk, Iowa Christian A. Weiss is listed as brother-in-law on the census of 1 January 1925 in the household of Henry Poppe at Waterloo, Black Hawk, Iowa. [S250] U.S. Federal Census 1930 U.S. Federal Census, by Ancestry.com, Year: 1930; Census Place: Downey, Los Angeles, California; Roll: 126; Page: 3A; Enumeration District: 922; Image: 268.0. Married Name Her married name was Mathews. Name Variation Katherine Weiss was also known as Katarina. Katherine Weiss married (?) Mathews. Katherine Weiss was born circa 1909 at Russia, USSR. She was the daughter of Adam Weiss and Barbara Dubs. 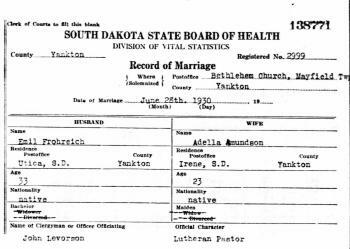 15 January 1920 Walshtown, Yankton, South Dakota Katherine Weiss was listed as a sister-in-law in Hugo August Frohreich's household on the 1920 Census at Walshtown, Yankton, South Dakota. Name Variation Katherina Car. Haar was also known as Katie C.
Name Variation Katherina Car. Haar was also known as Katy. Married Name 11 November 1914 As of 11 November 1914,her married name was Frohreich. Katherina Car. Haar was born in May 1888 at Russia, USSR. She was the daughter of Heinrich Haar and Dorothea Mueller. Katherina Car. 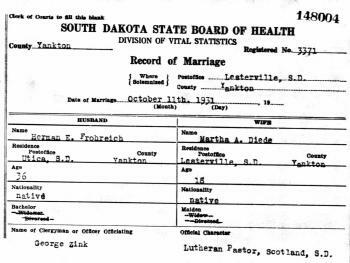 Haar married William Fred Frohreich, son of Herman Frohreich Sr. and Rosa M. Schramm, on 11 November 1914 at Hutchinson, South Dakota, County of Residence for her: Hutchinson; County of Residence for him: Yankton. She was buried after 2 October 1971 at Memory Gardens Memorial Park, Medford, Jackson, Oregon. [S272] Oregon Death Index, 1903-98 (published), Certificate: 71-15261. [S243] U.S. Federal Census 1920 U.S. Federal Census, by Ancestry.com, ED264. Dwelling 45. [S250] U.S. Federal Census 1930 U.S. Federal Census, by Ancestry.com, ED68-17. Dwelling 7. Name Variation Alyce Ella Frohreich was also known as Alice Ella. Alyce Ella Frohreich married Robert Raymond Myers. Alyce Ella Frohreich was born on 9 October 1915 at Yankton, South Dakota. She was the daughter of William Fred Frohreich and Katherina Car. Haar. Alyce Ella Frohreich was baptized circa 1916. She died on 18 April 2011 at age 95 Alyce Ella Myers passed away April 18, 2011, in Medford, Ore. She was born October 9, 1915, in Yankton, S.D., to William and Katie Frohreich. At age 18 she moved from Yankton, S.D., to Medford, Ore., where she lived with her grandmother and aunt. She later worked for Whiteclaw Candy Company as a chocolate dipper and retired after 37 years of service. Alyce was a member of Apostolic Faith Church for 77 years, with her faith in God being her number one priority. She enjoyed sharing her memories about growing up in Yankton on a farm and going to school with a horse and buggy. Her favorite activities to do in Oregon included huckleberry picking, fishing, hunting, going to the coast and camping. Alyce was always kind, had a smile on her face and had a wonderful sense of humor. Words cannot express how much she will be missed by her family and friends. She was the best Mom ever. Alyce is survived by her son, Ronald (Martha) Myers; grandsons, Lance Myers, of Casper, Wyo., Scott and Steven Myers, both of Medford, Ore., and Kevin Myers, of Corvallis, Ore; six great-grandchildren; three great-great-grandchildren; and brother, Edwin (Ruth) Frohreich. She was preceded in death by her husband, Robert Myers; son, Kenneth Myers; and brother, Walter Frohreich. A viewing will be held at 1:00 p.m., Saturday, April 23, 2011, followed by a funeral service at 2:00 p.m., at Memory Gardens Chapel. Name Variation Louise Hedwig Frohreich was also known as Louisa. Married Name 2 February 1937 As of 2 February 1937,her married name was Neff. Louise Hedwig Frohreich was born on 22 May 1912 at Central, Yankton, South Dakota. She was the daughter of Herman Frohreich Sr. and Rosa M. Schramm. Louise Hedwig Frohreich married Lee M. Neff on 2 February 1937 at Vancouver, Clark, Washington. Louise Hedwig Frohreich died on 15 September 1994 at Clackamas, Oregon, at age 82. Louise Hedwig Frohreich lived in April 1981 at Lake Grove, Oregon. [S243] U.S. Federal Census 1920 U.S. Federal Census, by Ancestry.com, ED267. Dwelling 101. [S250] U.S. Federal Census 1930 U.S. Federal Census, by Ancestry.com, ED15-47. Dwelling 88. Berna Ernestine Frohreich obtained US Social Security Card; as reported by California Death Index. Married Name 12 June 1928 As of 12 June 1928,her married name was Frohreich. Beatrice Jeannette Smith was born on 18 March 1906 at Marion, Indiana, also reported as South Dakota. She was the daughter of Frank E. Smith and Effie M. (?). Beatrice Jeannette Smith married George Rudolph Frohreich, son of Herman Frohreich Sr. and Rosa M. Schramm, on 12 June 1928 at Jackson, Oregon. Beatrice Jeannette Smith and George Rudolph Frohreich were divorced on 19 December 1945 at Medford, Jackson, Oregon, complaint for separation. Beatrice Jeannette Smith died on 27 February 2000 at Providence Medford Medical Center, Medford, Jackson, Oregon, at age 93 The funeral for Beatrice Jeanette Frohreich will be at 2 p.m. Saturday at Apostolic Faith Church. Mrs. Frohreich, 93, of Medford, died Sunday (Feb. 27, 2000) at Providence Medford Medical Center. Memorial contributions may be made to Apostolic Faith Church Youth Group, 285 Sunrise Ave., Medford, OR 97504. She was born Beatrice Smith on March 18, 1906, in Marion, Ind. She moved to the Rogue Valley in 1928 from Yankton, S.D. Ms. Frohreich worked for Medford Public Schools in the special education department for 23 years. She had been affiliated with the Apostolic Faith Church since 1936. Ms. Frohreich enjoyed playing in the orchestra, singing in the choir and teaching Sunday School at the church. Survivors include three daughters, Bonnie Sorenson, Medford, Bernice Cole, Yakima, Wash., and Faye Stehlik, Portland; 11 grandchildren; and 16 great-grandchildren. She was preceded in death by a son, Harold, in 1993; and two brothers. She was buried after 27 February 2000 at Siskiyou Memorial Park, Medford, Jackson, Oregon. Beatrice Jeannette Smith obtained US Social Security Card at Oregon; last residence Medford, Jackson, Oregon. She was a teacher in 1946 at Medford, Jackson, Oregon. Married Name after 1940 As of after 1940,her married name was Frohreich. Alice I. (?) married Hugo August Frohreich, son of Herman Frohreich Sr. and Rosa M. Schramm, after 1940. Eva Opal Lowe obtained US Social Security Card at Oregon; last residence not specified. In 1975 at Salem City Directory, Salem, Oregon. [S272] Oregon Death Index, 1903-98 (published), Certificate: 90-20034. Name Variation Walter Henry Frohreich was also known as Walt. Walter Henry Frohreich was born on 6 August 1921 at South Dakota. He was the son of William Fred Frohreich and Katherina Car. Haar. Walter Henry Frohreich married Leora Viola Groner in 1946. Walter Henry Frohreich died on 29 March 2008 at age 86. He was buried after 29 March 2008 at Memory Gardens Memorial Park, Medford, Jackson, Oregon. Walter Henry Frohreich obtained US Social Security Card at Oregon; last residence Medford, Jackson, Oregon. He was a egg candler with Medford Poultry and Egg Company in 1939 at Medford, Jackson, Oregon. On 1 December 1943 at U.S. World War II Army Enlistment, Monterey, California, Name: Walter H Frohreich Birth Year: 1921 Race: White, citizen (White) Nativity State or Country: South Dakota State: Oregon County or City: Jackson Enlistment Date: 1 Dec 1943 Enlistment State: California Enlistment City: Presidio of Monterey Branch: No branch assignment Branch Code: No branch assignment Grade: Private Grade Code: Private Term of Enlistment: Enlistment for the duration of the War or other emergency, plus six months, subject to the discretion of the President or otherwise according to law Component: Reserves - exclusive of Regular Army Reserve and Officers of the Officers Reserve Corps on active duty under the Thomason Act (Officers and Enlisted Men -- O.R.C. and E.R.C., and Nurses-Reserve Status) Source: Enlisted Reserve or Medical Administrative Corps (MAC) Officer Education: 2 years of high school Civil Occupation: Airplane Fabric And Dope Worker Marital Status: Single, without dependents Height: 00 Weight: 000. 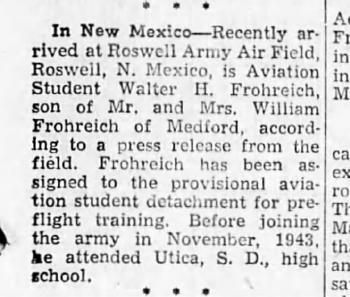 On 24 February 1944 Aviation Student Walter H. Frohreich article. He lived in 2000 at Medford, Jackson, Oregon. Edwin Raymond Frohreich was born on 13 December 1924 at Yankton, South Dakota. Edwin Raymond Frohreich died on 20 November 2014 at age 89 Edwin Raymond Frohreich, 89, of Medford, Ore. went peacefully home to the Lord on Thursday, November 20, 2014. He was born December 13, 1924 in Yankton, S. D. to William and Katie Frohreich. Edwin moved to Oregon with his parents in 1937 and graduated from high school in Central Point. He served for three years in the US Navy as a radioman during WWII. After his discharge he went to college and then became a builder until his retirement. He married Ruth Moeller of Eiserfeld-Siegen, Germany on November 30, 1966. He was a member of the St. Peter's Lutheran Church for 46 years.Edwin in survived by his wife, Ruth; daughter, Deanna; son, Dean; grandchildren, Brandon and Kevin and two great-grandchildren. He was preceded in death by his sister, Alyce Myers and brother, Walter Frohreich. In lieu of flowers, please make donations to the organ fund at St. Peter's Lutheran Church or the Medford Gospel Mission. A private family service will be held at 2:00pm on Tuesday, November 25, 2014 at Memory Gardens Chapel, 1395 Arnold Lane, Medford, OR 97501. Edwin Raymond Frohreich was a employee with SOSPCorp in 1946. He lived in 2000 at Medford, Jackson, Oregon. Martha A. Diede was born on 30 May 1913 at South Dakota. She was the daughter of Nicolaus Diede and Regina Schorzmann. Martha A. Diede died on 28 August 1970 at age 57. She was buried after 28 August 1970 at Martinus Cemetery, Utica, Yankton, South Dakota. 1935 Central, Yankton, South Dakota Martha A. Diede appeared on the census of 1935 in the household of Herman Emil Frohreich Jr. at Central, Yankton, South Dakota. 1945 Central, Yankton, South Dakota Martha A. Diede appeared on the census of 1945 in the household of Herman Emil Frohreich Jr. at Central, Yankton, South Dakota. Martha A. Diede lived in 1969 at Walshtown, Yankton, South Dakota. [S373] U.S. Federal Census 1940 U.S. Federal Census, by Ancestry.com, Year: 1940; Census Place: Township 95 Range 56, Yankton, South Dakota; Roll: T627_3870; Page: 5A; Enumeration District: 68-27. He was buried after 3 April 1980 at Memory Gardens Memorial Park, Medford, Jackson, Oregon. Reinhard Jacob C. Dubs obtained US Social Security Card at Oregon; last residence Medford, Jackson, Oregon. In 1942 at U.S. World War II Draft Registration, Medford, Oregon. [S9] South Dakota, South Dakota Birth Records South Dakota, File Date: March 06, 1942 (unknown file date). [S272] Oregon Death Index, 1903-98 (published). [S250] U.S. Federal Census 1930 U.S. Federal Census, by Ancestry.com, ED48. Dwelling 507. Sheet 7B. Name Variation Adella Edith Amundson was also known as Edith Adella. Adella Edith Amundson was born on 21 February 1907 at Yankton, South Dakota. She was the daughter of John Amundson and Anna Pedersdatter Rogen. Adella Edith Amundson died on 17 May 2002 at Hemet, Riverside, California, at age 95 ADELLA EDITH FROHREICH, 95, died Friday at her Hemet home. 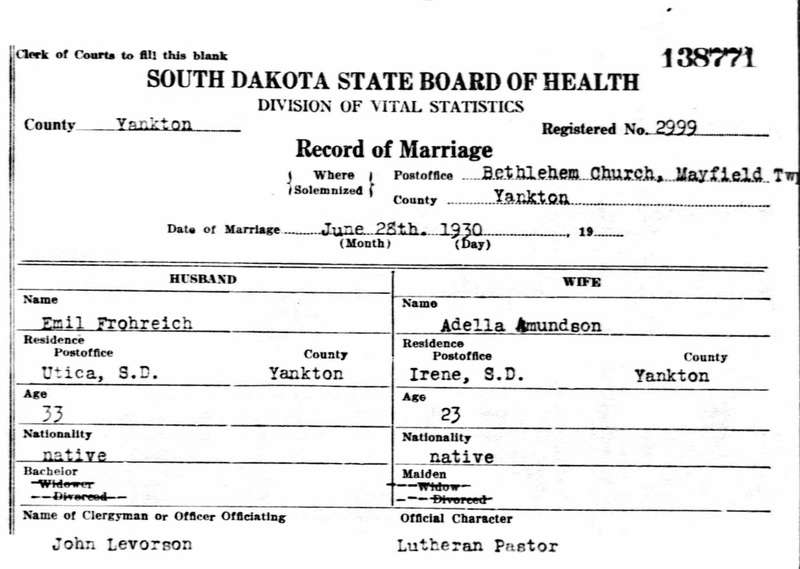 Born in Yankton, S.D., Mrs. Frohreich lived in Hemet nine years. She was a homemaker. 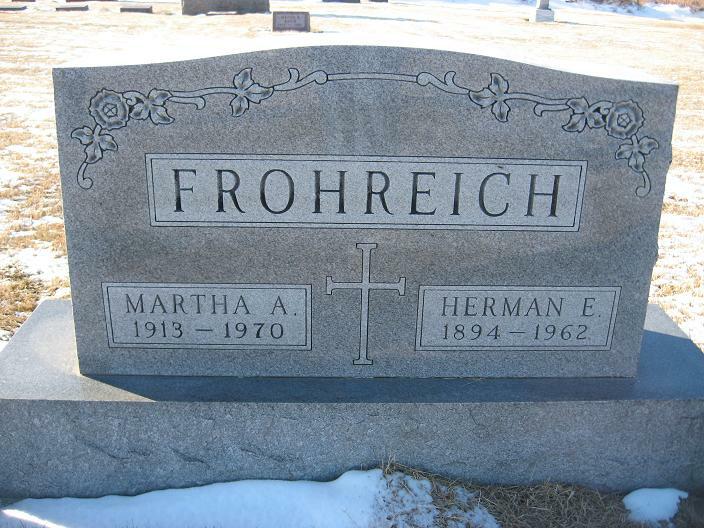 Mrs. Frohreich taught Sunday school and was a member of the Lutheran Women's Missionary League. She was also a Girl Scout leader. She is survived by three daughters, Janice Jackson of Perris, Donna Luedke of Hemet and Judith Nakamura of Montana. Services will be at 10 a.m. Tuesday at Miller-Jones Mortuary in Hemet. Burial will be in Martinus Lutheran Cemetery in Yankton. She was buried after 17 May 2002 at Martinus Cemetery, Yankton, South Dakota. 1945 Central, Yankton, South Dakota Adella Edith Amundson appeared on the census of 1945 in the household of Emil Theodore Frohreich at Central, Yankton, South Dakota. Adella Edith Amundson obtained US Social Security Card at South Dakota; last residence Hemet, Riverside, California. [S244] U.S. Federal Census 1910 U.S. Federal Census, by Ancestry.com, ED450. Dwelling 5. [S243] U.S. Federal Census 1920 U.S. Federal Census, by Ancestry.com, ED256. Dwelling 40. [S250] U.S. Federal Census 1930 U.S. Federal Census, by Ancestry.com, ED68-4. Dwelling 54. Lillian Dubs was born circa June 1919 at South Dakota. She was the daughter of Reinhard Jacob C. Dubs and Elsie Marie Frohreich. Lillian Dubs died before June 2013. Lillian Dubs was living in August 2005. Married Name December 1941 As of December 1941,her married name was Andrews. Bernetta Olivia Dubs was born on 16 September 1922 at South Dakota. Bernetta Olivia Dubs died in April 1986 at age 63. Bernetta Olivia Dubs obtained US Social Security Card at Oregon; last residence Medford, Jackson, Oregon. Married Name 27 May 1948 As of 27 May 1948,her married name was Jones. Marie Mae Dubs was born on 27 May 1927 at Medford, Oregon. Marie Mae Dubs married Duane Edwin Jones, son of Woodson H. Jones and Clara A. (? ), on 27 May 1948. Marie Mae Dubs died on 11 August 2005 at age 78 Marie Dubs-Jones was welcomed in to the presence with her Lord & Savior Jesus Christ on August 11, 2005. She was born in Medford, OR. She grew up in the Rogue Valley with six siblings under the prayers and love of Reinhard and Elsie Dubs. Marie was courted by and married Duane E. Jones, May 27, 1948 and they enjoyed 56 years of loving marriage. She was preceded in death by three sisters, her loving husband Duane and grandchild Mackenzie Grace (our little angel) who are celebrating her glorious arrival. She was a member of Apostolic Faith Church where she sang in the choir and played in the orchestra, as well as teaching Sunday school. She visited and ministered to residents in Care Centers for 51 years. Marie was a bookkeeper and secretary for many years in the valley with the firms, Crystal Spring Pear Co., Lewis Accounting, Peterson & Jones Construction and her late husband's custodial business. Marie enjoyed traveling extensively with her husband, spending time, joy and laughs with family, playing golf and hosting dinners. Marie is survived by her grateful family, which include sons, Steve and Reggie of Medford, Richard of Gold Hill, Troy of Eagle Point, Tom of Bend, and Mark of Eureka, CA; five beloved daughter-in-laws; eleven grandchildren; four great-grandchildren; one great-great-grandchild; two sisters, Lillian Dubs and Barbara Brown; and one brother Arthur Dubs, all of Medford, OR. A celebration for Marie will be held at Apostolic Faith Church, East Jackson and Sunrise, Medford, OR on Monday August 15, 2005 at 11 a.m. In lieu of flowers, donations may be made to Apostolic Missionary Fund, 135 Sunrise, Medford, OR 97504 or Providence Hospice Care, 1660 E. McAndrews Road, Medford, OR 97504. A private crypt side service will follow the celebration service at Memory Gardens, Medford, OR. Marie Mae Dubs obtained US Social Security Card at Oregon; last residence Medford, Jackson, Oregon. Married Name Her married name was Frymire. Lois L. Dubs married (?) Frymire. Lois L. Dubs was born on 10 February 1929 at Oregon. Lois L. Dubs died on 25 November 2001 at age 72. Arthur R. Dubs was born on 26 February 1930 at Oregon. He was the son of Reinhard Jacob C. Dubs and Elsie Marie Frohreich. Arthur R. Dubs died on 11 June 2013 at age 83 Arthur R. Dubs took the final walk home with our Father Jesus Christ on June 11, 2013. Arthur was born February 26, 1930, in Phoenix, Ore., to Reinhard Jacob Christian Dubs and Elsie Marie Frohreich. A Southern Oregon man through and through, he lived his entire life in the region. From a young age Arthur enjoyed working and playing in the outdoors. Arthur parlayed his strong work ethic into a successful development and custom home building business. Dubs Custom Homes populated the southern valley real estate market in the 1950s, 1960s, 1970s, and his homes are still as popular today as when they hit the market. During the 1960s, Arthur merged his love for the outdoors with his newfound interest in the film industry to document his outdoor adventures. The years of documenting trips and filming wildlife resulted in Arthur starting a motion picture business, Pacific International Enterprises, which put a little Hollywood in Medford. Arthur's Pacific International Enterprises created over 12 full-length feature films that played in theaters throughout the country and internationally. Nearly all of these films were syndicated internationally and continue to play throughout the world. In 1981, Arthur produced the film "Windwalker" which was nominated for an Academy Award. Arthur also wrote and produced the family adventure series the "Wilderness Family." In 1982, Arthur shut down the streets of Jacksonville, Ore., to film the movie "Dream Chasers." Arthur was also renowned for his hunting abilities. In 1960, Arthur took the world's largest polar bear as recognized by the Guinness Book of World Records and Life Magazine. He still holds the world record for the largest Grand Slam of North American bighorn sheep. In 2010, Safari Club International honored Arthur with the International Hunting Ring Award for his worldwide hunting accomplishments. Many of his hunting trophies will be on display at the Bass Pro Shops' Wonders of Wildlife Museum, Springfield, Mo. Finally, Arthur was a devout Christian who believed that unto whomsoever much is given, of him shall be much required. Arthur's stewardship of the Lord's gifts benefitted the Apostolic Faith Church, the Dubs Cancer Center, the Children's Advocacy Center of Jackson County, the United Way of Jackson County, Legal Aid of Jackson County, and many other worthy charities. The Arthur R. Dubs Foundation will continue to provide donations to Southern Oregon charitable organizations for years to come. He was preceded in death by his parents; and his sisters, Lillian Dubs, Bernetta Andrews, Marie Jones, Lois Frymire, and Mildred Friesen. Arthur is survived by the love of his life, Michele Pillon; three daughters, Pamela Girard, Lori Staten, and Joni Kaady; 11 grandchildren; and 15 great-grandchildren. He is also survived by sister, Barbara Brown, and numerous nieces and nephews. A memorial service for Arthur will be at 11:00 a.m., June 17, 2013, at Apostolic Faith Church, 285 Sunrise Avenue, Medford, OR. Duane Edwin Jones was born on 14 November 1923 at Emmett, Idaho. He was the son of Woodson H. Jones and Clara A. (?). 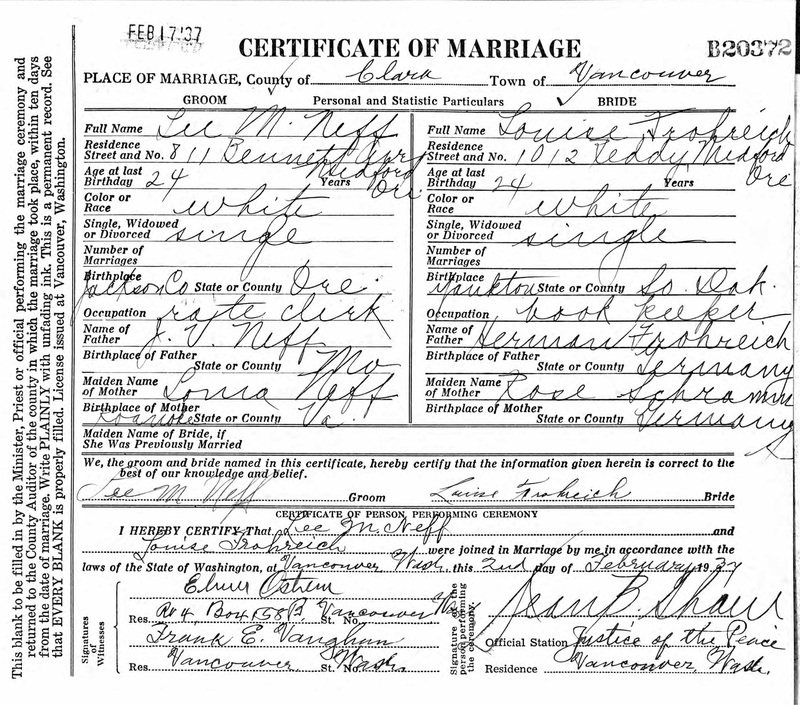 Duane Edwin Jones married Marie Mae Dubs, daughter of Reinhard Jacob C. Dubs and Elsie Marie Frohreich, on 27 May 1948. Duane Edwin Jones died on 27 July 2004 at Medford, Jackson, Oregon, at age 80 Duane Edwin Jones died Tuesday (July 27, 2004) peacefully at his home with loved ones by his side. A celebration of his life will be held at 11 a.m. Friday, July 30, at the Apostolic Faith Church, corner of E. Jackson and Sunrise, Medford Rev. Earl Phillips and Rev. Tom Pricskett officiating. A private cryptside service will follow at Memory Gardens. Duane was born November 14, 1923 in Emmett, Idaho to Woodson and Clara Jones. He grew up in Dallas, Oregon, graduating from Dallas High School as an outstanding athlete. He moved to Medford in 1942. On May 27, 1948, he married Marie Mae Dubs, who survives. They had been married 56 years this past spring and were active members of the Apostolic Faith Church. He was self-employed in a domestic and commercial cleaning business. Duane was a minister of music at the Care Centers and County Jails, also soloist for many events and sang in his church choir for over 60 years. He was also Youth Choir Director, church gardener and custodian for 23 years. He enjoyed gardening, playing golf, and spending time with the family. He and his wife traveled extensively, including a missionary trip to the West Indies in 1989. Survivors besides his wife are six sons, Stephen and Reggie of Medford, Richard of Central Point, Troy of Eagle Point, Thomas of Bend and Mark of Eureka, CA; eleven grandchildren; four great-grandchildren; and one great-great grandchild; two sisters, Jewel Hanlin and Maxine Baker of Phoenix, OR; and one brother, Efton Jones of Medford. Three sisters and five brothers preceded him in death. Friends and family may pay their respects at Perl Siskiyou Funeral Home on Thursday, July 29. Name Variation John Amundson was also known as John Amundson Brevik. John Amundson was born on 14 September 1853 at Leksvik, Norway. John Amundson married Anna Pedersdatter Rogen, daughter of Peder Rogen and unknown (? ), on 5 September 1881 at Union, South Dakota. John Amundson died on 26 August 1936 at Yankton, South Dakota, at age 82. John Amundson immigrated in 1874 on the steamship Tasso, paying 49 Norwegian dollars for passage. [S246] U.S. Federal Census 1880 U.S. Federal Census, by Ancestry.com, NA Film Number T9-0115 Page Number 513B. [S245] U.S. Federal Census 1900 U.S. Federal Census, by Ancestry.com, ED356. Dwelling 99. 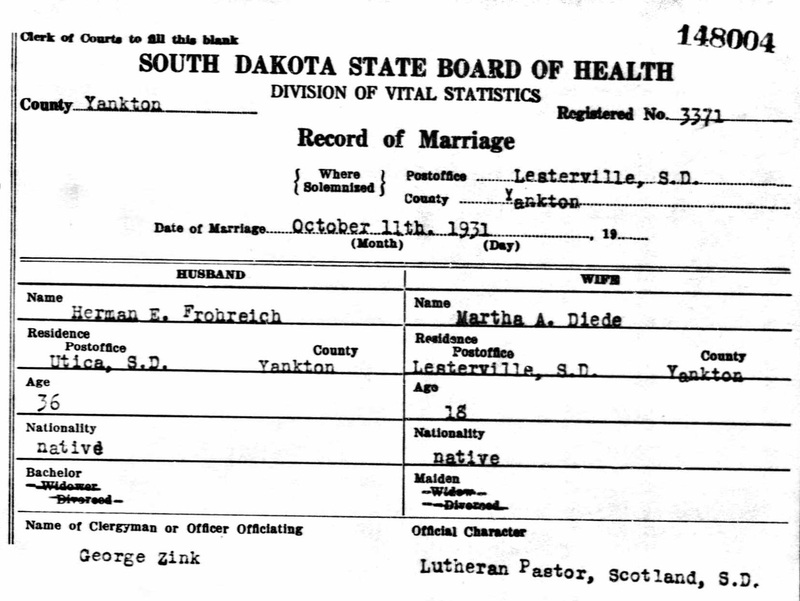 [S9] South Dakota, South Dakota Birth Records South Dakota, File Date: February 16, 1957 (unknown file date). [S9] South Dakota, South Dakota Birth Records South Dakota, File Date: April 15, 1957 (unknown file date). Name Variation Anna Pedersdatter Rogen was also known as Anne. Name Variation Anna Pedersdatter Rogen was also known as Annie. Married Name 5 September 1881 As of 5 September 1881,her married name was Amundson. Anna Pedersdatter Rogen was born on 28 May 1864 at Norway also reported as Jan 1864. She was the daughter of Peder Rogen and unknown (?). Anna Pedersdatter Rogen married John Amundson, son of Amund Olsen Brevig and Kirsten Nielsdatter Bjorneraas, on 5 September 1881 at Union, South Dakota. Anna Pedersdatter Rogen died after April 1930. Anna Pedersdatter Rogen immigrated in 1876. She had 9 with 8 living in 1900 children. She had 12 with 11 living in 1910 children. He was the son of John Amundson and Anna Pedersdatter Rogen. Carl Amundson died in December 1981 at Irene, Clay, South Dakota, at age 78. Carl Amundson obtained US Social Security Card at South Dakota; last residence Irene, Clay, South Dakota. 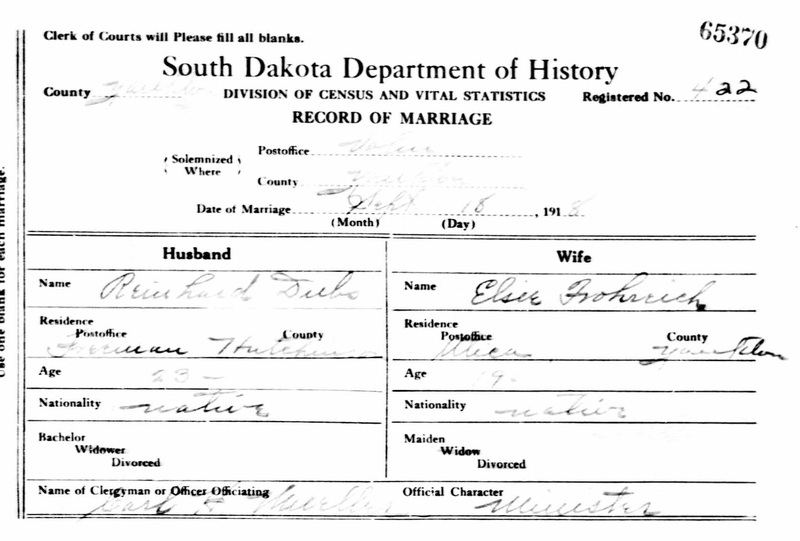 [S9] South Dakota, South Dakota Birth Records South Dakota, State File Number: 793677 (unknown file date). Name Variation Nicolaus Diede was also known as Nicholas. Name Variation Nicolaus Diede was also known as Nick. Nicolaus Diede was born on 9 August 1877 at Lesterville, Yankton, South Dakota. Nicolaus Diede married Regina Schorzmann, daughter of Heinrich Schorzmann and Magdalena Stoller, on 17 March 1902. Nicolaus Diede died on 26 January 1967 at age 89 Nicholas Diede obituary. Name Variation Regina Schorzmann was also known as Schorzman. Name Variation Regina Schorzmann was also known as Schortzman. Married Name 17 March 1902 As of 17 March 1902,her married name was Diede. Regina Schorzmann was born on 29 March 1883 at Lesterville, Yankton, South Dakota. Regina Schorzmann married Nicolaus Diede, son of Michael Diede and Carolina (? ), on 17 March 1902. Regina Schorzmann died on 13 July 1963 at Scotland, Bon Homme, South Dakota, at age 80. Regina Schorzmann had 5 with 5 living in 1910 children. Reinhold Diede was born on 29 February 1908 at South Dakota. Reinhold Diede died in December 1984 at age 76. Reinhold Diede obtained US Social Security Card at South Dakota; last residence Utica, Yankton, South Dakota. Name Variation Hilda L. Schenkel was also known as Schankel. Married Name 28 February 1929 As of 28 February 1929,her married name was Diede. Hilda L. Schenkel was born on 4 August 1912 at South Dakota. She was the daughter of David Schenkel and Lydia Bierle. Hilda L. Schenkel died on 24 November 1982 at age 70. Hilda L. Schenkel obtained US Social Security Card at South Dakota; last residence Utica, Yankton, South Dakota. Charles William Best married Genevieve Tansey. Charles William Best was born on 22 January 1899 at Nappanee, Indiana. He was the son of John Milton Best and Pearl Stott. Charles William Best died on 25 July 1973 at Toledo, Ohio, at age 74.